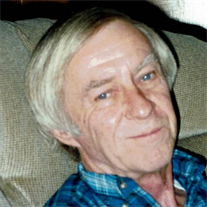 Richard Charles Hernbloom, 78, of Salina, passed away Sunday, May 14th, 2017. Richard was born in Chappell, Nebraska on April 28, 1939, a son of the late Helen (Bills) and Morris Hernbloom. He co-owned DD&S Electrical Company. On August 17, 1970, Richard married Mildred Nelson in Fairbury, Nebraska. Survivors include wife, Mildred of the home; son, Jeff Hernbloom and wife Rachel, of Overland Park, Kansas; grandsons, Conner Hernbloom, of Overland Park, Kansas, Nathan Hernbloom, of Overland Park, Kansas; brother, Duane Hernbloom and wife Sandra, of Salina, Kansas. He is also survived by two nieces. Visitation will be held from 12:00 pm – 8:00 pm, Saturday, May 20th, at Carlson-Geisendorf Funeral Home. The family will greet friends from 5:00 pm – 6:00 pm. Memorial contributions may be made to American Diabetes Association 608 W Douglas Ave, Wichita, KS 67203.